Base Model Compatibility : A1286. Condition: Removed from new MacBook, may show signs of removal. Apple Part Number: NONE. Date Compatibility: 2008-2013. We work very hard to ensure that your back up and running as quickly as possible, we understand that it may just be a phone or tablet but we are all pretty lost without them! OEM Apple MacBook Air 13" Cooling fan - Grade A. Condition: Removed from notebook, fully tested. Apple Part Number: N/A. Date Compatibility: All. We work very hard to ensure that your back up and running as quickly as possible, we understand that it may just be a phone or tablet but we are all pretty lost without them! Base Model Compatibility : A1297. Apple Part Number: NONE. Date Compatibility: 2009-2012. Condition: New. We work very hard to ensure that your back up and running as quickly as possible, we understand that it may just be a phone or tablet but we are all pretty lost without them! Base Model Compatibility : A1286. Apple Part Number: NONE. We work very hard to ensure that your back up and running as quickly as possible, we understand that it may just be a phone or tablet but we are all pretty lost without them! Base Model Compatibility : A1502 Macbook Pro 15". Apple Part Number: 616-0190. Warranty: 12 Months. Date Compatibility: 2013 / 2014. Model Number: CC120K06. We work very hard to ensure that your back up and running as quickly as possible, we understand that it may just be a phone or tablet but we are all pretty lost without them! Base Model Compatibility : A1278. Condition: Removed from Macbook, tested OK. Apple Part Number: NONE. Date Compatibility: 2012. We work very hard to ensure that your back up and running as quickly as possible, we understand that it may just be a phone or tablet but we are all pretty lost without them! Taken from - Lenovo Ideapad 300-15IBR. Grade A Looks new with no scratches or any sign of usage if it is a hard disk drive it will be factory tested with a stated warranty and RTB. Scratches will not be heavy but may be visible and light. Supported hard disk: B-key trigeminal M. 2 SSDs with NGFF interface (support 22x30 22x42 22x60 22x80 size). Supported Notebook: 9.5mm Thick SATA Interface Optical Drive Laptop. 9.5mm SATA Notebook Drive Hard Disk Cooling Bracket. Suitable for: HP ProBook 5310 5310M. 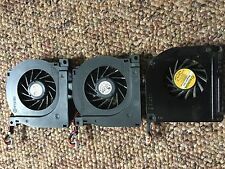 - Replace your faulty, cracked or broken laptop CPU cooler fan. 1 Piece CPU Cooling Fan. 20X(9.5mm SATA Notebook Drive Hard Disk Cooling BracketSupported Notebook: 9.5mm Thick SATA Interface Optical Drive LaptopSupported hard disk: B-key trigeminal M. 2 SSDs with NGFF interface (support 22x30 22x42 22x60 22x80 size)Support to turn off the fan, middle, small, three adjustable speedPulling the shrapnel for easy disassemblythin heat dissipationcolour: BeigeMaterial: Aluminasize: 12.7*12.7*0.95cmPackage Contents: 1*Hard Drive Cooling Bracket1*ScrewdriverNote: Hard Drive is not included.Only the above package content, other products are not included.Note: Light shooting and different displays may cause the color of the item in the picture a little different from the real thing. The measurement allowed error is /- 1-3cm.) . ACER TRAVELMATE 8481 LAPTOP Internal CPU Cooling FAN. ACER TRAVELMATE 8481 LAPTOP FAN. Internal Component! Fully tested and working item pulled from new or factory refurbished machines. See title! No collections allowed. Product Type .